You are looking for a perfect property in Lille, Le Touquet..
our buyer agent can find it for you ! The North : A convivial and welcoming land. Do greater riches exist than the welcome, the sense of festivity and the unwavering friendship offered by the “People of the North.”? The metropolis is made up of 85 communities and more than a million inhabitants. 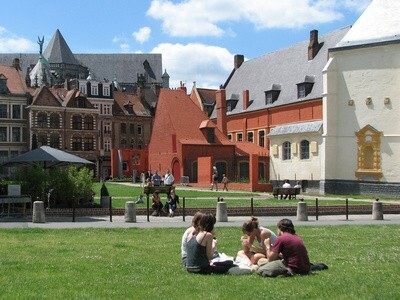 Lille has preserved the charm of its past as well as an exceptional architectural heritage. Shopping and culture, gastronomy and nature are connected by an omnipresent network of public transport. Everything is there ! Discover a boulevard like no other connecting Lille, Roubaix and Tourcoing. This axis founded the metropolitan area. Along its river banks there are exceptional homes. Everywhere one looks there is a vista of structures. The architecture along the way is inspiring. In past centuries factories were erected as works of art in Rubaix,Tourcoing, Now converted, today they symbolize the dynamism of the area with lofts that New York would surely envy. In the city of Lille, one finds a labyrinth of streets and cobblestones lined with superbly restored homes are mixed with colorful monuments from the 17th and 18th centuries. The country is never distant. Wherever you are, forests, hiking trails and greenery are only minutes away. Villeneuve d’Ascq makes for a wonderful excursion just one minute from the grands axes (the major roads). In Roubaix, the Barbieux park and its century old trees make up the largest urban green space north of Paris while the Citadelle garden in Lille is like a page out of history. As Coté Acheteur buyer agent in Lille, I can guide you throughout this rich and contrasting city to help you find the property that best fits your needs. Reconstructed after the war, Dunkerque has experienced a rapid expansion linked to the prodigious development of its port. More recently, the project Neptune remodeled its centre. This attraction makes property rare and dear. The Cité de Jean Bart (and its outskirts) ranks amongst the leading cities on the coast. This area is an immense garden suspended between the sky and the sea and bordered by kilometers of fine sand. You’ll admire the boats docked on the quays and can take advantage of the beach and the countless marine activities. Douais preserved its 18th century homes and its aristocratic allure. Valenciennes is one of the larger industrial centres in the department of Nord. The principle industries are automobiles, mechanical construction, railway products and pharmaceuticals. The heart of Valenciennes was almost entirely destroyed by a huge fire during the Second World War. It was reconstructed during the 1950s and 60s in a style that combined concrete, brick and stone. This recent metamorphosis offers the inhabitants of Valenciennes a high standard of living at affordable prices. Cambrai was the first community in the Nord department to obtain the prestigious label ‘City of Arts and History’ awarded by the French Minister of Culture and Communication in 1992. Its houses, townhouses, streets and squares have seen more than five centuries of urban and real estate development. Art deco, art nouveau, Flemish or Mediterranean – the rich architecture in Touquet retells the history and stories of this young seaside resort. Young because Le Touquet-Paris-Plage was established in 1882; a year marked by the construction of the first two chalets placed on the sandy, desert-like terrain. Despite a demand that surpasses availability, I will help you unearth the rare pearl that you are dreaming of at the heart of this atypical real estate market. The richness and diversity of properties available in this region can fulfill all of your desires. The cities : Lille with its different areas (Saint Michel, Old Lille, Centre, Wazammes, Fives, Vauban, Solferino…. ), Roubaix, Tourcoing, Dunkerque, Villeneuve d’Ascq, Wattrelos, Valenciennes, Douai, Marcq en Baroel, and Cambrai will open the doors of their single family homes, 1930s Flemish villas, mansions, investment properties or atypical lofts. Again, let yourself be guided. In my capacity as a real estate coach and thanks to my knowledge of the local fabric, I am at your service to advise and support you from start to finish and to help you find the right property at the right price in your timeframe.